My son bought a Schiit BiFrost $400 DAC that claimed to have async USB support but immediately found out that he got PC noise through it just like his other solutions. So I instrumented it and this is what I found. 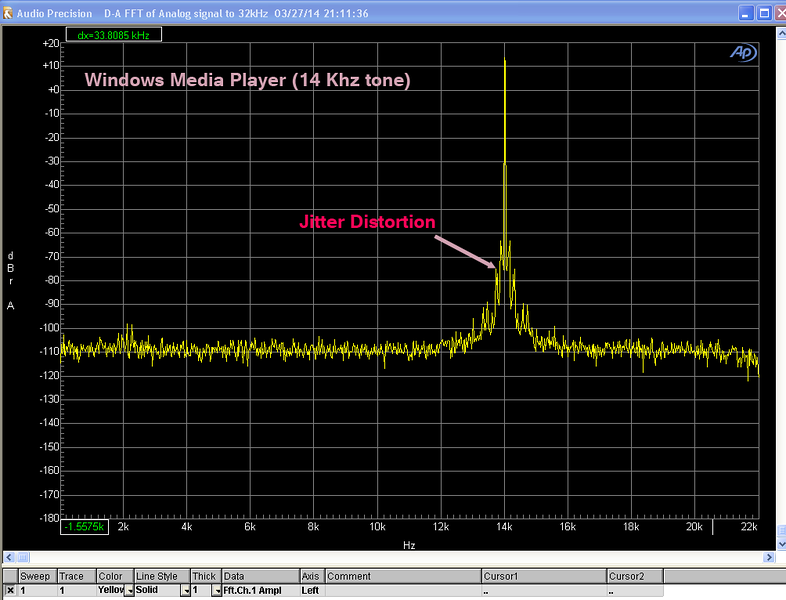 I wouldn't expect this kind of jitter in a $25 DAC let alone one for $400. Didn't think there would ever be a DAC that had more problem with S/PDIF than USB but here we are and the huge jitter spikes are gone. But they are replaced with low frequency ones around our main tone. All the jitter is gone!!! We went back to WMP player and let it read the file for a bit and it too settled down to the same performance as Media Player Classic. Clearly system activity disturbed this DAC. Its brochure brags about "isolation" but the word "galvanic" is not there. This means that it is not isolated from the PC ground and that is feeding into the oscillator causing those correlated jitter spikes. He sent the DAC back to get his money. When the check arrives, I will mention which DAC it is . It would have been interesting to see if you could induce the jitter (or noise) by maxing out the processors compiling something while playing back using the Media Player Classic.. I am still not convinced it is a galvanic isolation issue, rather than a problem with WMP itself. 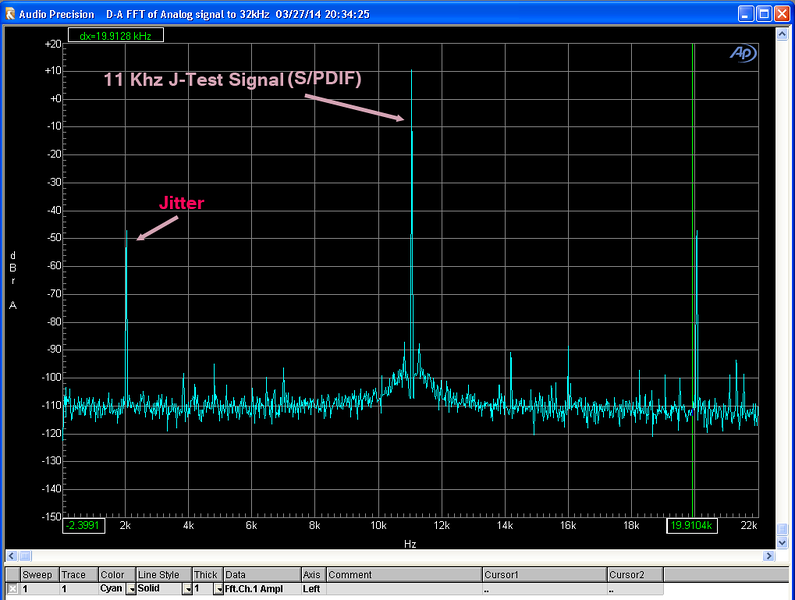 I understand software doesn't generate jitter, but maybe it is some sort of jitter-like noise on the signal? My son could hear the computer activity as he played his game on his machine. I could not instrument his machine so tried to duplicate with the same benchmark on a Sony laptop but could not. Definitely not a problem with WMP. My team at Microsoft wrote it . The difference between the two was large amount of buffering WMP does before it starts playing. It is a heritage of the same code being used for streaming where you read ahead as much as you can. MPC on the other hand reads and plays and reads and plays so its activity profile is continuous. The issue here may have been disk traffic. Regardless of the source, the cause and effect was predictable and very explainable. Definitely not a problem with WMP. My team at Microsoft wrote it. At least you were able to rule out expectation bias. Sound from mouse / hard disk etc activity used to be a known issue with PC speakers, back in the day when all they did was "beep". The speaker driver was a simple active switch - one side of the speaker was connected to "ground", the other side was switched alternately between "ground" and V+ (usually 5V) at the frequency of the beep. Normal rest condition was supposed to be with the speaker switched to "ground", but if it happened to be left switched to 5V the speaker was effectively connected across the power supply (via a capacitor). Any noise on the power supply was reproduced by the speaker. You are dating yourself Don. That could be read more than one way... and I do not appreciate at least one of them. The problem is still there, most desktop type systems still have this beep circuitry, to generate the beeps you hear at power up time. There's usually a dedicated speaker / sounder on the motherboard or case front panel, and the output may also be mixed into the line / speaker output jack of the onboard sound. I'm curious as to the DAC, did you get that check back. Yes, he got his money back. The DAC was a Schiit. Reminded me of when listening to an album (LP and CD); during quiet passages I could hear the radio playing through the speakers! When I discovered that many moons ago I simply tuned the radio to a dead station (AM or FM - it has to be dead silent). Yes, he got his money back. The DAC was a Shiit. There's a Schiit Ragnarok Integrated Amplifier full equipment review in this month's Stereophile. I don't think it is online yet, the measurements are "interesting". I cannot say with exactitude, and of course I have not measured. But, I have loaded up my Win 7 PC (older Intel I7) with quite a few tasks, like maybe 6-7 of them - multiple large file copies and file reformats (all to/from my NAS) - while simultaneously listening to 5.1 music played by the PC. That playback was from JRiver software, also doing bass management and on the fly DSD-PCM conversion, feeding full range Dirac EQ all on the same PC. The USB DAC is an Exasound E28, which is advertised as galvanically isolated and which uses asynchronous USB via its own ASIO-like driver. I heard no difference on many occasions. But, while it was not a bias controlled listening experiment, I would not hesitate to do it again. I do not recall what the PC resource utilization was, but I think it was well over 50% of CPU on average. I was still blissfully enjoying my listening as each of the tasks invidually completed at different times. Still, I heard no difference as each, then all, were done, except the music playback. Some time back, Archimago in his blog did a somewhat similar test, but with measurements. He also found no measurable or audible difference until CPU utilization got to over 85%, as I recall. But, I am not sure of the software and DAC specifics. Meanwhile, we have the Wild West of computer audio, which is overwhelmed by unsubstantiated listener claims of this and that, even much more so than conventional, non-computer audio. Some of those claims relate to noise and timing issues caused by the OS (Windows) in doing its work. The more work, the worse it is, allegedly. Hence, the need to nullify, to turn off many OS functions by using a miracle product. I have seen no objective tests of any of these products and their supposed advantages. So, I feel no need to play those games. And that's the way it should be. Get a good, isolated USB interface and then it shouldn't make a difference what is going on in the PC. Certainly I don't worry about it on my good interfaces. CPUs run far faster than I/O devices. My instinct says the CPU just gets bothered once in a while to keep the buffers that dribble data into the output interfaces topped up so the transmitter/receiver chip always has data ready to go. That's right. And it is those interrupted I/O calls that become audible due to their sudden and regular event. It is common to "hear your hard disk seek" in poor quality audio implementations. In my poll for ranking DACs by preference, one of those files is from the sound card on a six year old laptop. Another is the headphone jack of my smartphone. Surely you guys can parse those out. If a Schiit cannot match the performance of those devices that is pitiful. While not SOTA they have no jitter issues like the topic of this post. 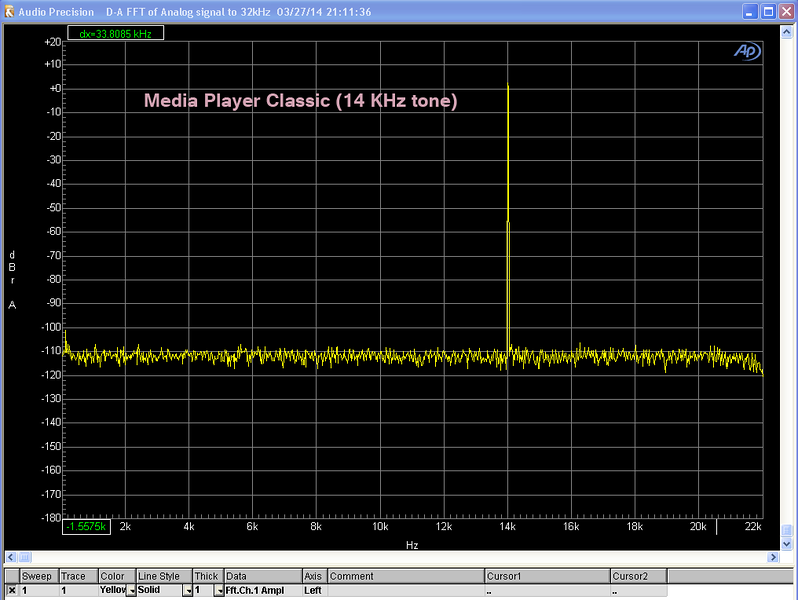 In my pool for ranking DACs by preference, one of those files is from the sound card on a six year old laptop. Another is the headphone jack of my smartphone. Surely you guys can parse those out. If a Schiit cannot match the performance of those devices that is pitiful. While not SOTA they have no jitter issues like the topic of this post. We have been shamed to do this test guys . I am up to my eyeballs on projects right now but I hope others participate in that thread/listening test. They put the review online today. One way to design a unique sounding product. And pretend it is special. Seems an insane design. The fact they may have tamed it enough not to be horrible isn't all that impressive. The review was very favorable. I like the comment that is best feature is a lack of remote control, and the barely discernable markings on the front panel. This in a product that can't hope to function without continuous (30 times per second) on going adjustment by a CPU controlled system. Better yet there wasn't a good explanation as to why this curious fragile strange marginal performing design was beneficial. The more I see of their products the more I think they are just rubbing the audiophile faces into Schiit.